FreeCell is the enormously popular solitaire game included with Windows. Because all cards are visible at the start of the game, it is almost entirely a game of skill. Almost all FreeCell positions can be won. The most notable exception is the game #11982 in Microsoft FreeCell and Pretty Good Solitaire. In the video below, I show how to play FreeCell using the game Pretty Good Solitaire on Windows. The rules of FreeCell can be learned in just a few minutes. It will take longer, however, to learn how to play well. Some players have played hundreds of thousands of games of FreeCell. It is possible to never lose unless you come upon a very rare unsolvable game. The key is to simply never give up. If you get stuck, undo your moves and start again. With Pretty Good Solitaire, it is possible to undo all of your moves, not just one. 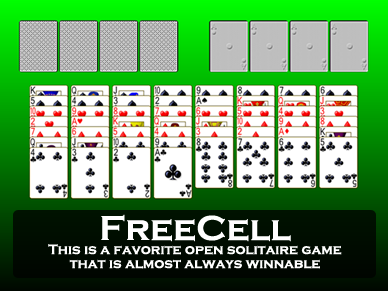 FreeCell was invented in the early 1980s by Paul Alfille on the PLATO educational computer system at the University of Illinois. A intern at Microsoft, Jim Horne, then wrote a version of the game for Windows in 1990 that was eventually included in Windows 95. Since then the game has exploded in popularity, becoming one of the most popular solitaire games. Download FreeCell and over 900 other solitaire games for Windows 10! All Downloads Below Work in Windows 10! Pretty Good Solitaire is the best way to play FreeCell. It contains FreeCell and more than 50 other solitaire games similar to FreeCell, such Sea Towers, Penguin, Eight Off, Double FreeCell, FreeCell Duplex, and many, many more. For Windows 10, Windows 7, or Windows 8/8.1 or macOS or iPad. FreeCell Plus is FreeCell the way it ought to be. Like Pretty Good Solitaire, its game numbers are compatible with Windows FreeCell. Undo any move or all your moves or play in Climb Mode from game #1 on up. FreeCell Plus for iPad is only 99 cents! 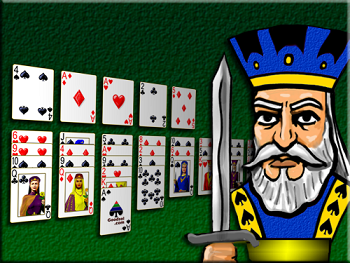 Play FreeCell and 11 other games for free in Goodsol Free Solitaire, a freeware download for Windows. You can play game numbers from 1 to 11982. All except the last one are winnable! For Windows 10, Windows 7, or Windows 8/8.1 only. Play FreeCell for free online. Michael Keller's information site about freecell lists solutions to games in Microsoft Freecell, the history of FreeCell, and much more. Includes the Index to the catalog of solutions to deals in Microsoft FreeCell and Pretty Good Solitaire. This site is copyright ©1999-2017 Goodsol Development Inc. All Rights Reserved.